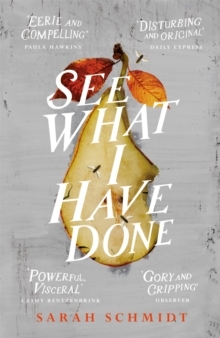 Haunting, gripping and gorgeously written, SEE WHAT I HAVE DONE by Sarah Schmidt is a re-imagining of the unsolved American true crime case of the Lizzie Borden murders, for fans of BURIAL RITES and MAKING A MURDERER. 'Eerie and compelling' Paula Hawkins'Stunning' Sunday Times'Gripping... outstanding' Observer'Glittering' Irish TimesJust after 11am on 4th August 1892, the bodies of Andrew and Abby Borden are discovered. He's found on the sitting room sofa, she upstairs on the bedroom floor, both murdered with an axe. It is younger daughter Lizzie who is first on the scene, so it is Lizzie who the police first question, but there are others in the household with stories to tell: older sister Emma, Irish maid Bridget, the girls' Uncle John, and a boy who knows more than anyone realises. 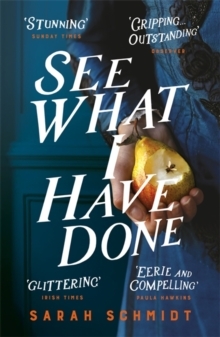 In a dazzlingly original and chilling reimagining of this most notorious of unsolved mysteries, Sarah Schmidt opens the door to the Borden home and leads us into its murkiest corners, where jealousies, slow-brewed rivalries and the darkest of thoughts reside.